I’m a big fan of trains. I ride them quite a bit when I’m in Poland. The experience varies from pretty good to miserable. “Miserable” usually means a train is oversold, and you end up standing (or squatting) in the corridors. If you’re lucky, it will be negative 20 outside and some sort of frozen precipitation will be seeping through the gaps in the windows. Not fun. Still, they’re not all that bad. And there is something about riding the rails that is impossible to replicate in any other form of transportation. Perhaps it’s the feeling of open-country freedom, or the sheer might of the multi-ton machine, or the leaving-the-station romance that train travel conjures. Trains seem to fit Europe. Roads are generally poorer, fuel more expensive, and population clustered dense in cities. European rail networks are extensive and heavily traveled. America presents a different story. Amtrak was started in 1971 as the US intercity passenger train service. America was a “car nation” in the 70s, and still is today. American automobile ridership has long dwarfed that of trains. The other issue is that Amtrak is heavily subsidized (in recent years between $1 and 2 billion annually). Going by passenger-miles traveled, government money for Amtrak is much higher than that devoted to highway infrastructure or the aviation industry. Amtrak critics have likewise sought defunding and privatization. Amtrak does have a few profitable and heavily-traveled routes, mainly in the northeast, but most simply aren’t. So you’ll often see Amish on trains or waiting in urban stations (at Greyhound stations too). 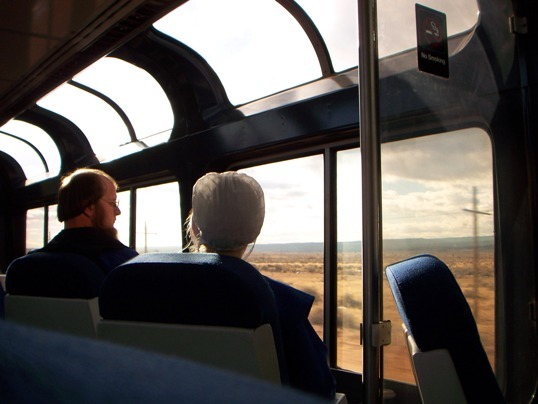 If you’ve taken any longer rail trips, perhaps you’ve shared a car with Amish riders. 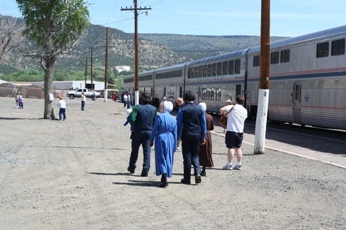 Amish youth travel west on extended excursions. Some Amish go even further, to Mexico for cheap medical treatment. Lancaster Amish have frequent occasions to ride the rails, as Amtrak runs right through the county. Market stand workers, for instance, may catch a train into Philadelphia, and get off about a dozen blocks from Reading Terminal Market. A friend’s brother used to ride from Lancaster City up to Elizabethtown to work as a hired hand at an organic farm. I don’t expect Amish to radically change their transportation practices anytime soon. But what about the rest of us–will we always be a car nation? I know I’ll continue to ride trains regularly when in Europe (which, it should be said, are also heavily subsidized). I don’t have a car there, and the convenience can’t be beat. Part of this is due to the nature of cities and towns in Europe. Most decent-sized European towns have extensive public transportation. When I visit my grandmother in the Warsaw suburbs, I take the 3-hour train from Krakow. I get off at the central train station, then hop on the subway or the city bus, just a short walk away. 15 minutes later, I’m there. Most Polish cities and towns, even the smaller ones, are similarly convenient when it comes to public transport. It would be hard to do the same in most sprawling American towns and cities, though, outside of the very large ones. So while I continue to love trains in general, with the way things are in the US, I don’t see myself using Amtrak too much. Some of us do use the service, of course. And trains form a historic part of the nation’s infrastructure. They also have great sentimental value, for myself included. Amtrak may not be a very economically efficient means of transportation. Is there a way to make Amtrak profitable? And if there isn’t, is it worth keeping around anyway? I wonder how Amish riders would feel. I used to ride Amtrak fairly regularly back in DC. It was a convenient way to get north or south. My longest trip was from Boston to Denver. Canada does not have good rail service anymore, which is a shame, as it would be the best way for us to get long distances. But VIA rail is terribly expensive, which seems counter-productive. I have never ridden on a train and I would like to some day. Oh, I was on them as a kid at ammusement parks, but I mean a real train like Amtrak. A former teacher of mine, was afraid to fly and use to travel a great and sometimes didn’t want to drive-she took Amtrak. She would have been a good advertisement for them as she felt that was the only way to go. You could see the country out the window. I love train journeys because they make me feel like I am on my holidays and because I’m sitting there sweeping past the houses, towns and farms.The sway of the train too is relaxing and there’s no traffic jams. I would not say that the roads are poor in Europe Eric!Just because we do not need 5 lane motorways everywhere does not make our roads “poor” and while in Eastern Europe things are poorer, that too will change in time(Yes, I have visited an Eastern European country).As our countries are smaller we do not need bigger, wider roads.It’s not fair to judge Europe by American standards when are needs are different and our countries differing in size & population. Lucy point taken, but I wouldn’t say they are poor either–just poorer, on the whole, than American ones. Nothing tops the vast American road infrastructure (or driving experience, for that matter). If you pick just Western Europe, or one country such as Germany, you are closer, but you are still not there. We have big roomy cars, and wide spacious roads. In European countries like Italy, the Smart car, basically a shoebox on wheels, thrives. Convenient for negotiating tight European city streets, but I wouldn’t want to get hit in one. Poland’s cars, scaled-down, less-safe versions of American ones, rattle over potholed roads. I’m not necessarily criticizing Europe by saying roads are not as good. Europe is different geographically, historically and politically, and these factors have all led to differences in the transportation situation. But it is what it is. That said, at least we can agree on the joy of train journeys! I guess I’m just naturally not convinced of the value of such broad statements, like “the roads are better in Europe.” It’s a big continent, and I’m wondering how much of it you’ve seen. Because while many cities do have smaller roads, as befits an older civilization that was designed long before the modern automobile, they get a better atmosphere in those cities because of exactly that. So “better” may be a matter of your definition of the word. But there are many countries in Europe whose roads are by my personal observation very similar to ours, including Germany, whose autobahns were the model Eisenhower borrowed for our interstates, and are considered by many to be superior to ours. As for the cars being smaller, I think statement’s that’s also a bit too broad; where do you think the massive BMWs, and Mercedes, (to say nothing of Rolls Royces, Bentleys, Range Rovers and Jaguars, if you include the UK) come from? Finally, and this may be a matter we agree on, it’s pretty well established that the passenger rail systems in many European countries (Switzerland, The Netherlands, Germany, for example) are far advanced when compared to our own. Clearly, considered how large our country is, it should invest more in rail systems, as it did in the early years when there were fewer people and goods to be transported. In 1995 I took Amtrak from Illinois to northern Idaho. They had a special excursion fare going on and it was actually a lot cheaper than driving. Along with less wear and tear on me considering I was traveling alone. I had a pleasant experience on the train and truly enjoyed every minute of it. I got to see some of the most beautiful sites and some of the nastiest too,,, but it was from the comfort of the train and I was able to really look and take pictures rather than having to stare at the road. There were some less than savory characters on the train but they left me alone and I stayed away from them, LOL. The meals were incredible! And I was really blessed to be called to a very late supper in the dining car. Most people were complaining on having to eat supper so late, after 9pm but I loved it. We just happened to be going through Glacier National Park at that time and you could not complain about the view one bit!! Yes, I was hungry by the time we were seated, but I didn’t care. I would not trade that train trip and its memories for anything. Would I do it again? You bet your sweet bippy I would, LOL. Sometimes, the added expense is just worth it to not have to deal with driving yourself. Alice I recognized in your description some of the same reasons I love riding trains so much. The views, adventure, and even food on cars are all a ton of fun. I bet there are some spectacular US routes that just don’t get seen that often. The one you did sounds great. Erik, it was awesome. I went north out of Chicago up through Minnesota, across North Dakota. Then across the northern part of Montana. I’ll never forget getting off the train in Havre, MT and the smell of the tall pines was actually stronger than the smell of the train refueling. We went through very flat land into the mountains. Turned back a little south again in the mountains and hit Glacier National Park before going into Idaho. Two of our Amish friends from Michigan, young ladies in their early twenties, took the train to visit with us in May of last year. The cost for a sleeper was pretty high — over $1000 — so they chose to sit up for the two-and-a-half day ride, which cost about $350. We had a wonderful time showing them the California coast, from Malibu to Monterey. Los Angeles, I believe, was their least favorite, although they did get a kick out of seeing the “tiny” Hollywood sign as we headed across the LA basin. You’re right about the Amish heading for Mexico in search of inexpensive medical treatment. Apparently there are clinics in Tijuana just over the border with ties to American medical institutions, including the Mayo Clinic. The Amish stay in San Ysidro and use the pedestrian crossing. Not sure how things have changed since the passport requirement went into affect a couple years ago. At Union Station in Los Angeles there are almost always Amish folks there, waiting for their next connecting train either south to San Diego or east to home. When we brought the girls back to the station after their visit we met a very nice couple who live in Shipshewana, not far from where one of our friends worked. It’s a small world! Nice tale Alice. I can imagine those views. Trains are a place for meeting people, and having adventures. As a young buck traveling Greece with a buddy many years ago, we had a train change in Athens. As we got on board, my friend was pickpocketed by someone squeezing by in the corridor. Our two Nigerian cabin-mates-to-be noticed it happening and intervened, one getting his wallet back while the other chased the pickpocketer through the station. Needless to say we made good friends for the rest of the journey. Amazing that these guys would intervene for complete strangers. I still remember their names–Chris and Sunny. They were physically huge, so I think the pickpocketer got quite a fright. Apparently they were working in Greece to earn money for back home. I’m not sure if you can still get those really cheap excursion fares any more Erik as I have not checked in a long time. But if I could get it reasonable enough, I would go on a trip like that again. I could get on and off the train as many times as I wanted so long as I gave them an itinerary in advance. It was a pretty good deal. Yes, you certainly do meet some interesting people on the train. I really clicked with that steward once he realized I was not complaining. I made some other friends on the way back. It was just a really good trip. Of course that was a long time ago. Not sure how things would be today. In the conservative community I was with, you hired a driver to take you to the closest bus or train station that had service for where you wanted to go. The neighboring Swartzentrubers did the same. We did not hire a driver for every little thing, we used our buggy if at all possible. Since I left the state has subsidized a bus line through town. It goes once a day each way. For the Amish there, this has become their only way to other places in the world. To visit a friend about 80 miles away, you drive a buggy 10 miles to the bus flag stop, then ride the bus about 50 miles, where a driver picks you up and takes you the rest of the way. You do tend to sit in bus/train stations traveling this way. I would have stayed Amish if I could have found a group that did not hire drivers on Sunday while allowing me to keep my retirement account. Such could not be found. The Amish with higher ordnung in the midwest use drivers extensively and often go 1/2 way across the country in hired vans pulling trailers for the luggage. If they cannot find enough to fill the van on their trip, they will reluctantly use trains or buses. We never did that. I grew up riding the train, long before Amtrak, because my dad worked for the RR. Except on luxury trains, it could be a miserable experience: breakdowns, lateness and missed connections, failed air conditioning in southern summer heat, uncomfortable seats, crying children, lousy overpriced food. My dad said that, even in the 1950s, most passenger rail was unprofitable for the RRs, and so they did everything they could to kill it off. Four years ago, we took a trip on Via Rail (Canada’s Amtrak) from Toronto to Quebec City, with stopovers in Ottawa and Montreal. It was great! We rode in first-class, where the service and food were better than on an airplane, and the accommodations were much nicer. The trains even ran on time. I’m sure improving service on Amtrak would result in more business, but I’m not sure passenger rail can ever turn a profit in North America, except maybe in urban corridors or on special tourist excursion trains. Now that world oil production has peaked and is beginning to fall off some, all while the rest of the developing world is growing their thirst for oil products, we can expect to see gasoline, diesel, and jet fuel become much less affordable here in the US. I’m talking real prices that will double, triple, or more, from the present, probably within the next 10 years. That said, I don’t think we’ll get rid of our cars. What will happen is we may only have 1 or 2 cars per family where we had 2 or 3 before. Trips will be shorter. Electric cars will pick up some of the slack, but they will never cover long distances purely on electricity. Roads are mainly made out of rock glued together with oil (bitumen) and they’ll become far more expensive for a government, already overdrawn, to maintain. Some local, esp. rural side roads will slowly return to gravel and dirt. Indeed, in some places, this is already happening. Counties and states will have to decide which main roads and highways to prioritize upkeep too. Given all this, we can expect that we’ll use less cars, traveling mainly for shorter distances, though we’ll probably still have them for around town use. Intercity car use will become more expensive and range-bound. Airlines simply won’t exist on $10 jet fuel except perhaps on a greatly slimmed down schedule to just a few major hub airports, for the remaining rich. Airliners cannot be electrified and despite what some dreamers proclaim, we won’t be farming jathropha oil in the Third World to power the Rich World’s aircraft. I expect bus service and train service to grow for intercity traffic given that airline travel will largely cease to exist for most folk and car travel will, as I say become range and dollar limited. Bus service too, will do well, if and until, major highways start suffering due to the decline in society’s ability to continue spreading copious amounts of new, hot mix asphalt mix. Many of the world’s former oil exporting nations have now or will soon be becoming oil IMPORTING nations thanks to their oil production declining all while their people are growing their own domestic petroleum consumption. Yemen, Indonesia, Egypt, the UK, have already suffered this, and Mexico (one of the US’ main oil suppliers) will soon join the former. After many years of people talking about the coming oil decline, it is now happening. Expect BIG changes in the next decade or two on the transportation scene. Excuse me Cleone, but I do not believe Erik makes things up as you put it. Please do keep in mind that there are varying degrees of strickness amongst the Amish, and while some might not be as plain and use computers there are still plenty who are very plain, refuse computers and technology. I think your statement is quite rude and uncalled for. Just as there are many secular churches with their own beliefs there are many Amish churches each with their own ordnungs, and beliefs. By no means should my comments about Oil Decline and the coming difficulty with cars be taken as support of Amtrak in particular for, indeed, Amtrak has many problems. It’s amazing how expensive Amtrak sleepers are. Years ago, from what I’ve seen of fare price lists (I wasn’t around then myself), sleepers perhaps added half to perhaps another whole fare on top of the coach fare whereas nowadays it can triple the fare or more. Perhaps it is true that there were more small, “section” compartments back when compared to the present when the roomettes and full bedrooms are much larger and for this reason, sleeping accommodations add so much to the rail fare. In any case, I wish you well in your car, but I have to ask, when gasoline is $9 to $12 a gallon, half of the gas stations in the US have closed, making gas on the go hard to even find, and when a fifth of the bridges on the interstates are closed or have detours around them, I wonder if that won’t start to take some of the polish off of the car ride? I’m just saying, after many years of mere talk and predictions, huge changes are now coming within the decade. People, stay flexible in your travel modes and arrangements. The Amish that I am *somewhat* familiar with in Aroostook County Maine certainly do not use any of that stuff you mention. Cleone, I diagree with you. I enjoy Eric’s here. He uses different subjects. Some people like some things some like others. I happen to look forward every day to see what he has on here. Some Amish use computers and some don’t. Some use them when their order does not allow them to use computers. I think that all of Eric’s does discuss the Amish. looks like a cat fight on Amish America. And I have to side with Alice and Marilyn regarding how accurate Erick’s Amish America is, ive looked up just for kicks some of the comments Erik has made and have found his information pretty dead-on. Does Erik promise that a few Amish are not checking out the internet, how could he. I’ve known a Amish or two who lets say stretch maybe what they can do and get away with it, but for the most part most seem to follow the golden rule. Now Alice if anyone going to make something up, its going to be me, lol. See I just got on and im already helping make things right with the world. But that’s one of the reasons that I love America, is that we have freedom of speech, and everyone has a opinion. Even with my little blog I try and be accurate, and if im not I respect someone calling me on it, because im still learning and im not a walking dictionary of Amish history. But I will read up on a topic before I post it. So cleone just give the site a chance, and lets enjoy each others comments and respect each other ok, no one is trying to pull the wool over your eyes, ok. And hang in there ok, you wont really find a better site, and lets all be friends. wow ive really out shinned myself, oh before I forget Marilyn your fired, Alice your hired. in-side joke folks,lol. And about Amtrak, when I was last on it, which was in aug 2010 I took a peek at the sleeping area of the sleeper section, and right before I got thrown-out I got a pretty good look . The bed is so small, they have to strap you in incase you roll out of your bed. Gonna pop by your site before I go offline for a while, been a very busy day today and I am tired. Drill before reaching $9-12 gas? Stephen the energy topic is an interesting one too; as for $9-12 gas, wouldn’t public pressure lead to us drilling our own reserves before reaching that point? As I understand it, the US has a ton of oil that we don’t exploit anywhere near to the fullest. I just see us going 100% after oil resources before giving up the car for mass transit. “Rightly or wrongly” people feel a lot of pain when gas prices get high, like in 2007-8. I think a lot of that is because the car is just so integral to our lives and infringing on the freedom it represents will always get a strong reaction. Damon you and Magdalena both mentioned VIA rail; I had not ever heard of it (I guess that’s another example of the stereotypical American lack of knowledge of our northern neighbors). I wonder what their ridership/subsidy situation is like. It seems like Canada would deal with the same geographic and cultural obstacles to the adoption of rail travel that Americans do. Lance you have a unique perspective as someone who has been a part of an Amish community, and a quite conservative one at that. So I have to say I always appreciate your take, and especially this firsthand look at the difficulty of long distance travel. I do have to ask: you say you drive your buggy to the bus flag stop and then get on the bus for the long part of the trip. What happens to the buggy, though? Is it hitched up all day, does someone else drive it home? Hi Erik, Alice & Richard…love reading what you have to say…..
Mona; The Canadian National (CN) [it’s a railroad reference, too] Tower is the correct name. Toronto is a really neat city. Maybe not worth making itself its own province, but it is still a grand and varied place. Erik; I know that VIA Rail covers the corridor between, at least, Windsor, Ontario, through Toronto, Ottawa, and Montreal, Quebec, but how much further, I’m not sure. It probably services the rest of the country, but rail service in the modern sense is more geared toward industrial needs and does not focus much on passenger traffic anymore. You can travel by rail in this country, but it sounds like it’s complicated to do so, likely there are “regional carriers”, but one really has to work hard and do a lot of planning if one wants to travel by train from, say New Brunswick’s Atlantic coast to British Columbia’s Pacific coast. Blame for this would be the ease of air travel and the rise of the personal automobile. Generally though, it seems the major players (companies) in the rail road industry are still the historic ones, the CN (Canadian National Rail) and the CP (Canadian Pacific Rail), even in the USA one may be able to see their logos on the sides of cars going by. I was once told that CP and CN actually allow VIA to use their lines because their tracks. In the Toronto orbit the same may be true for GO (Government of Ontario) Trains which runs commuter trains from the east to the west of the city’s bounds. This is what I understand, I may be wrong. Passenger Train Service is drastically different in Canada in 2011 than it was in 1911, or even in the 1960s, which perhaps from a simply ecological point of view, is sad. I for one believe train service needs to improve in Canada. I guess I was too brief in my comment. You are taken to the flag stop by someone and they take the buggy back. You don’t want to be late as the bus only passes through town twice per day, once going north, once going south! If your trip did not have good connections, it was possible to spend 1/2 a day or more sitting in one bus station. Not a lot of fun, unless you meet other Amish! Still, our way never required a driver to leave his own family for long periods of time while waiting for us to visit. In the Amish world I was in, you are almost always at a Amish house on Sunday, even if you have been traveling. I never understood those Amish that had a driver haul them 1/2 way across the country and then have that driver wait until the end of the trip to take the Amish back. That driver is asked to be away from home on a Sunday, something Amish are loath to do. It is a behavior I could not adjust to. I was blessed to have found the group I did in this respect as we could only be taken to the bus or train by driver, not the whole trip. The driver was only used on the ends of the trip. Now the home end does not require a driver, just a friend with a buggy. My dad very much dislikes flying now since there are so many security check points and has taken the train out here to Washington (state) from his home in Virginia almost every year since my husband and I have been stationed here (almost 6 years now). This Christmas past, he decided to get a roomette and boy was it expensive! But, his meals were included and he had a place to sleep all to himself so he felt that outweighed the cost. I think almost every year, the train has been delayed for one reason or another, but Amtrak has always been amiable in releasing info to people about what is going on with the train. They also twice have put my dad up in a hotel in Chicago on his return trips because there’s not a big layover between trains on the eastbound line and he got stuck and missed his second train. So, even with delays and such, I think Amtrak does an admirable job of trying to make up for the inconvienience. What a shame that everyone is not allowed to express their feelings (right or wrong) on this site. Makes a person feel that if they don’t agree with everything that they are going to get jumped all over. Keep up the good work Erik and sorry I felt the need to express my fears from what is being posted. Mary, first, I do appreciate the kind word. But I’m a little unsure what you mean, perhaps you could clarify? As long as someone doesn’t use profanity, they are welcome to post their thoughts here. On the contrary, we’ve had plenty of good, respectful discussion in the comments sections, with a variety of opinions shared, regularly. In fact, the people that read this site and share their thoughts really make running this site a blessing, and one of the reasons I enjoy it so much. So I have to disagree with you that people aren’t allowed to express their feelings. You are more than welcome to comment anytime, and I hope you will Mary. I have traveled on Amtrak at least 200 times, and all the way from Portland maine to Los Angeles, California and back, plus a lot of other routes across the U S A and parts of Canada. You didn’t mention you were Amish in that post! And that you handed out tracts in your travels as an Amish man-so guess that could overlap into the “do Amish evangelisze?” topic too! I love trains. The first time I remember seeing Amish on one was on a trip my youth group was taking from California to new Mexico. It was a young couple and they had a baby. Both dad and baby were dressed alike…. Kelly green shirts with black suspendered pants. I wish I could remember the mother’s hat and what it looked like. I am a big fan of trains. Children are permitted to travel independently at age 8 (with an extra fee for supervision). My parents live at the other end of the Philly-Harrisburg line, and it was great to shuttle the kids back and forth. I have traveled across the US, it takes 3 days. It is like riding through the national geographic. I have traveled from Philly to South Carolina. No, our trains aren’t like Europe’s. Our roads aren’t like Europe’s either…nothing compares to the autobahn. We can’t compare ourselves to South Africa, Japan or China either, without getting depressed. How do we save Amtrak? Use it. Regularly. And, if you are lucky, your seatmate might be Amish. I also love trains but a different kind. I like steam engines. Every summer we go someplace where I can ride them. West Virginia, NC, CO or NM. This year we will go again to Durango, CO and Chama, NM. I also like being on ferries. One time we traveled to Toledo and were met in the doctor’s office by a local welcoming committee consisting of a husband and wife, who answered our Toledo questions and presented us with a goodie bag of store-bought cookies and a magazine. It was very thoughtful of them, a ministry they volunteered. So Alice Mary, if you want to meet Amish in Chicago, going to Union Station is one opportunity!